He first created a storm when he was selected as the winner of highly rated international TV show ‚The Successor’ to officially take over the celebrated mystifier, Uri Geller. Since then, he has performed with enormous success in 42 countries around the world, regularly appears on prime time TV. His live performance on the Tonight show floored both Jay Leno and guest, Zac Efron and his popularity got him voted best mentalist in the world on German TV show, Pro 7. Adding to Lior’s talent as a mentalist is his natural ability for creating an all-round entertaining performance. 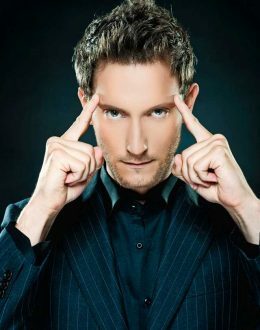 Throughout his live show, ‚Supernatural Entertainment’ , Lior relies on full audience participation to perform supernatural feats far beyond telepathy and mind reading. He uses members of the audience to perform his acts, interacts with them and elates their senses by taking them on an exciting adventure built on drama, tension and astonishment doused with a huge sprinkling of humor, comedy and fun. CEOs of the world’s top companies regularly book Lior to perform and MC at business events to draw in potential customers or motivate employees with his astonishing display of mind-reading trickery and humor. Lior has also been invited to attend more intimate, crucial business meetings both by businessmen and politicians as a way of breaking the ice.